The four-week countdown is now on until audiences in Liverpool can experience a brand new stage comedy telling the fascinating story of John Lennon‘s missing childhood banjo. An intriguing mix of fact and fiction, Lennon’s Banjo is set in present day Liverpool and features an all-star cast. Pete joins an exciting all-start cast featuring a whole host of familiar faces – Eric Potts, Mark Moraghan, Jake Abraham, Lynn Francis, Danny O’Brien, Stephanie Dooley, Alan Stocks, and Roy Carruthers. 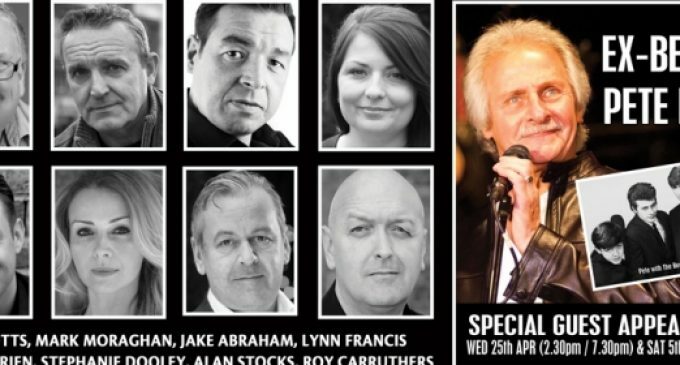 Pete Best will appear as himself, with Alan Stocks portraying Pete Best in all other performances. The quest is on to find the holy grail of pop memorabilia – the missing banjo on which John Lennon was first taught to play music by his mother Julia Lennon, who first introduced the youngster to rock and roll. Julia Baird is John Lennon‘s half sister – and vividly remembers watching their mother teach John how to play. Julia fully supports the new play.